Listen, we know what it’s like. You’re planning a trip and you don’t want to spend hours trawling through a million accommodation listings and reviews just in case you might regret your choice. We have a range of great booking options in South Kerry that you can browse below but top of our list is The Moorings in Portmagee. The Moorings is a beautiful and well-appointed guesthouse, restaurant and lively Irish pub located directly across the road from the pontoon where the boats depart; check it out in the header image. You can watch the boatmen getting ready while eating your breakfast and just leisurely walk outside onto your boat; no stress! No driving like a maniac to get there in time or, worse still, missing the trip of a lifetime because you slept in. The Moorings has been the go-to accommodation for visitors to Skellig for over 25 years. They have put more people on boats than anyone else in the area and, to top it off, they even have access to a boat specifically for their guests, the Lady Clare. They were also heavily involved in the making of the Star Wars movies in the area, being the site of the Pre-Production Office for Star Wars: The Force Awakens and the wrap parties for The Force Awakens and The Last Jedi. Mark Hamill – Luke Skywalker – has even jumped behind the bar to pull a pint. Which is why the Moorings put together a special Star Wars Package for fans who want to feel the true power of the Force for themselves. Full Disclosure: We’re related to the owners, so you can discount accordingly but we honestly would find it difficult to recommend anywhere better in terms of location, convenience and experience. 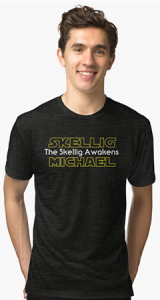 Because of that, we’ve got a special rate for SkelligMichael.com users that is cheaper than you’ll find on any booking site. There is a lot of other high-quality accommodation in the area and we strongly advise that you stay locally the night before your trip, in order to minimize stress on you the next morning. There’s no point in starting your day driving at 100 mph on narrow Kerry roads. And, once you get here, you’ll realise that one night is simply not enough time to enjoy all that the Skellig Coast has to offer.